Q. Why didn’t you go to school? A. Well, before, parents would think that girls would attend school only to be able to write and read and send love letters to their boyfriends, so my father did not allow me to go to school. But look at me now learning to write and read at my age! Q. What motivated you to learn how to read and write? A. I never had anyone that motivated me to learn. But once I became sponsored, the staff members would always encourage me to come to the classes they provide [at the Unbound office] and here I am, learning. I already know how to write my name, see! I wanted to write the letter to my sponsor, instead of relying on someone else to do it for me. I want to write to her and tell her that I am doing very well, that I am deeply grateful for everything she is doing for me and that I am still caring for chickens, dogs, etc. I had three children and now I have eight grandchildren. Now I will be able to read what they write at school. Juana practices her writing exercises. Juana, far right, and her literacy group at the Unbound office in the Dominican Republic. Q. What did you do for a living when you were younger? A. I used to sell fried finger foods on the streets. I had a spot at the public market. Q. How did you know that people were paying the right amount? A. (Juana laughed at this question!) Well, I didn’t know! Sometimes people would pay me less or I would give more change than I was supposed to. Sometimes I made money; sometimes I lost money! Q. What’s something that has changed from when you were young to the present day? A. Before you could go out at night and not worry about anything. Nowadays, there is always danger out there. One does not feel safe. Q. Do you have any dreams that you want to accomplish? A. Yes! I want my life to be as peaceful as possible. I want to find a deeper spiritual peace inside me — that is my dream. 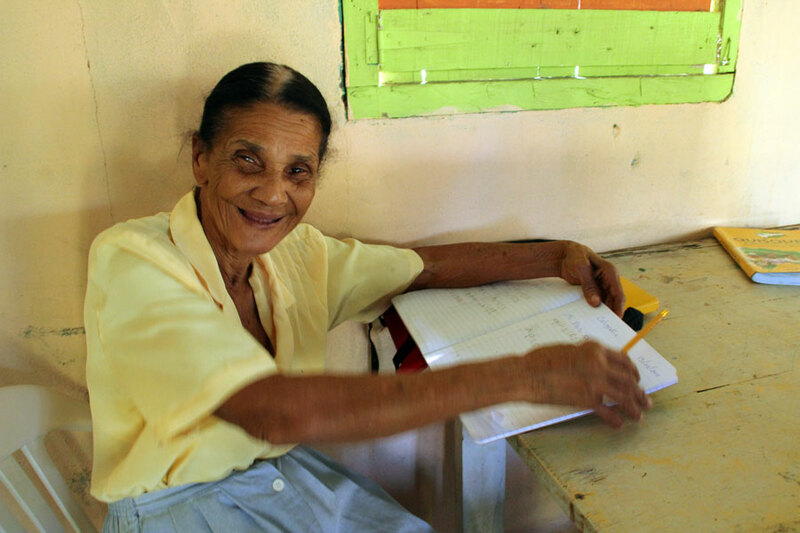 Want to help others like Juana? Sponsor an elderly person today!